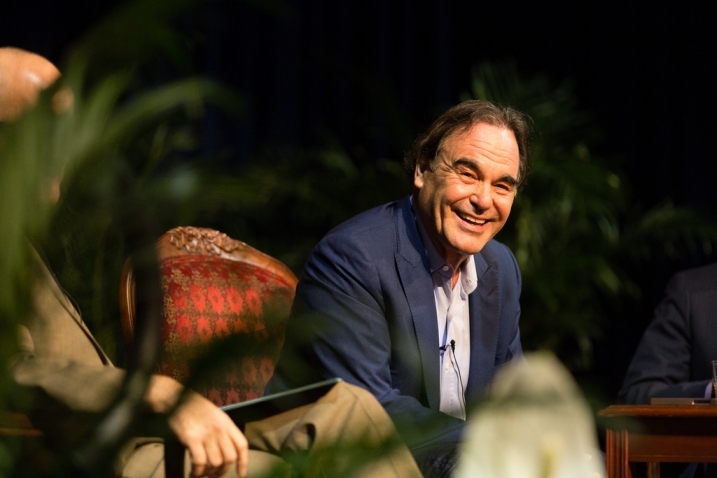 A few weeks ago, I had the privilege of hearing Academy Award-winning director Oliver Stone speak at a local college. Stone has recently released his documentary series The Untold History of the United States, and the accompanying book of the same name. According to stone, the series explores the darker side of American politics and policies, specifically during the Cold War era, that were and still are often ignored by conventional historical texts, yet have nevertheless profoundly impacted the world we live in today. During his presentation at the college, Stone began with a summation of the events which influenced his life’s work and their consequent impact on American society. The second half of the presentation consisted of a Q and A session involving the students and faculty of the college. Stone, a veteran of the Vietnam War, expressed that his experiences in combat during 1967 and 1968 had a profound impact on his later work, including Platoon, Born on the Fourth of July, and the lesser known Heaven and Earth. Likewise, he shared with the audience his belief that when he entered the Army in 1967, he did so under the pretense that he was doing good for his country. “I was a conformist in the 1950s. We were scared.” said Stone, referring to the rampant McCarthyism of the period. After his stint in the military, Stone expressed that he had become enlightened. His eyes, so to speak, were opened to the travesty and hypocrisy of global conflict in the 20th century. Over the course of the Q and A segment, Stone received questions ranging from his experiences as a screenwriter to the validity of Natural Born Killers as a satirical piece. Stone spoke at length about working with legendary actors like Al Pachino, Michael Douglas, Willem Dafoe, Charlie Sheen, and many more. One question in particular that Stone seemed especially passionate about was on the topic of his critically acclaimed film Wall Street. When asked if he had thought that the phrase “greed is good” would become so culturally iconic, Stone stated that the film was meant to portray the madness and material obsession during that particular point in time. He went on to say that the widespread adoption of the phrase proved his point exactly, and that only in a diseased culture would people come to idolize such crooked characters as Gordon Gekko. The striking thing about Oliver Stone is that he is most decidedly from a different era. By that I mean that he is not only an old man, but he seems to be stuck- mentally stuck- in a different time period. One need only talk to the man for a few minutes to realize that the world as it is now- as it is to the younger generation, in all of its subtlety and complexity, is quite lost on him. That being said, I simply don’t see him creating any more sweeping cultural commentaries like Wall Street, simply because he’s from an age where incredible culturally shaping events and concepts, the internet for example, we’re far off dreams. Nevertheless, Oliver Stone to this day remains one of the seminal American filmmakers. His work has inspired us, shocked us, got us talking, and stirred up controversy; after all, isn’t that the aim of any great artist? The evening ended with rapturous applause, and I can say that it was a pleasure to hear such a talented director speak.